Nothing much to say tonight, except to recommend this book I’m reading. 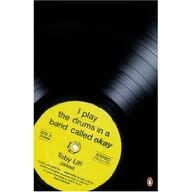 Toby Litt’s I Play the Drums in a Band Called Okay. Started reading it last night and have found it really hard to put down – to, you know, go to work, do stuff etc. If you’re into music at all, a poor obsessive muso like me even, I can definitely recommend it. I’m adding it to my wishlist now and, as always, am looking forward to you next post (always of merit).